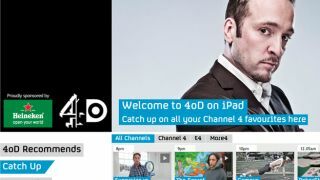 Channel 4 has announced a major upgrade to its 4oD application for iOS and Android. The new-and-improved 4oD app, coming in early 2013, will allow users to tune in to the whole range of channels through the Watch Live functionality. That means free, ad-supported, live streams of C4, 4+1, E4, More 4 over Wi-Fi and mobile internet, are coming directly to the iPhone, iPad and applicable Android devices. The second major addition is offline viewing. This will enable C4 fans to load their device with programming for when there's no connectivity or limited data allowances. That functionality is not yet available on the BBC iPlayer Android app (although it is on the iOS version), so score one for Channel 4. Finally, the 4oD refit will also enable Pause and Play. Sarah Rose, Channel 4's Commercial and Business Development Director, said: "We're very excited to be the first commercial public service broadcaster in the UK to offer mobile offline viewing, enabling our viewers to catch up with Channel 4 wherever they may be. "The introduction of 'Watch Live' on the move and cross-platform 'Pause and Play' is great news for our young-skewing audience who are increasingly watching our content on multiple mobile devices."